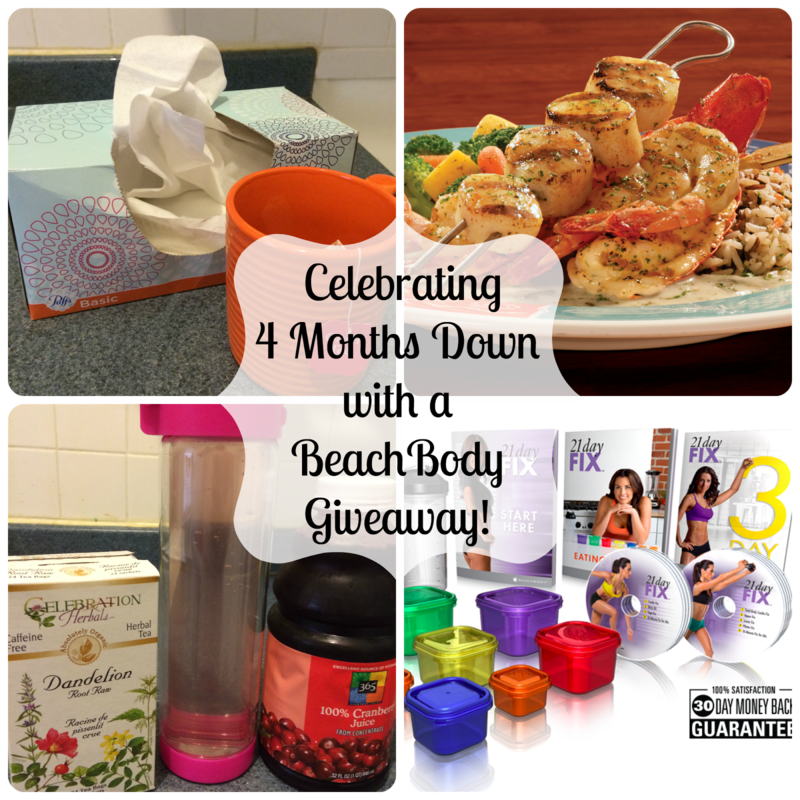 Celebrating 4 Months Down with a BeachBody Giveaway! This post is sponsored by Beachbody. I lost 0.6 pounds for a total lost of 42.2 pounds. Nutrition: On Wednesday we decided to celebrate Mother's Day early so I did go to Red Lobster and had whatever I wanted. What I ordered wasn't as appetizing as the commercial showed so I was a bit disappointed on the amount of calories I consumed. I started the Jillian Michaels Detox Water on Thursday and have been doing good so far with it. It is supposed to help you shed water weight and relieve bloating. Fitness: I was sick all week so I didn't have the energy to get to the gym at all. I did take three walks though. Quickstart guide with a workout calendar. I love 21 Day Fix! That program was worth every dime I spent! Great job and all of these products are so great! Your link to enter is broken-goes to savings.com! This looks like a good proven system.. 21 days is not a long time! At least you are substituting lost time in the gym with a long walk. Way to challenge yourself. When you publish your goals, the more likely they get done! I am seriously so proud of you!!! That is incredible!!! Way to go! And awesome giveaway! Congrats! I look forward to following along with your progress. Congrats on doing so well in your fitness journey. This is definitely a super way to celebrate! It is awesome you set specific goals for yourself each week- it has to be one of your keys to success! Congrats on doing so good on your weight loss program. This is an awesome giveaway. You are amazing and I love being part of the journey. I admire that you use DVD's and you are your own trainer and buddy. I enjoy working out a lot more when other people are included! 42lbs down is awesome. Awesome job sticking with it for 4 months now! what a lovely generous giveaway! Good luck to all participants. I too did not enjoy my first visit to Red Lobster. Except for the complimentary cheesy bread, i found non worth coming back. Congratulations on your weight loss! I am sorry that Red Lobster disappointed. I have always been happy with my meal there, but it really does stink when you realize you consumed a lot of calories for something that wasn't very satisfying. Congrats.. this is really amazing that your have been setting goals and achieving them all! Good job on meeting your goals. Weight loss is hard so I'm happy to hear you're crushing it! Congratulations! you are doing amazing work! Wow that's a lot of progress! I really need to start getting my self ready for the summer! Good for you! I'm almost at 40 and have 25 to go! You keep on working hard girl and you'll get there! totally want some abs like that! amazing giveaway!